Did you know you can visit by boat? Just pull up to our docks where you can enjoy free moorage for up to four hours! From I-5, take the City Center/Tacoma Dome exit #133. Merge onto I-705 and follow the signs for Schuster Parkway. After you exit to Schuster Parkway, you will turn right at the light (4th Street Bridge). After crossing the bridge, the road turns to the south again and becomes Dock Street. The Seaport is in the Balfour Dock building (705 Dock Street), which is the second building on the left. Look for the large glass wall and enter through our front door! The Foss Waterway Seaport has a 15 space parking lot on the North End of the Building. These spaces are free of charge and are available to use whenever the museum is open to the public or hosting an event. Republic Parking manages a lot to the north of our lot. It is a pay lot and all users are responsible for payment in advance. Street parking on Dock Street between our building and The Dock Building is also available. This is currently free parking. Standard City of Tacoma parking regulations apply. Further down Dock Street, there is parking along the side of The Dock Building and at Thea’s Park. Thea’s Park is part of the Metro Parks Tacoma system and parking regulations for Metro Parks locations can vary from the City of Tacoma or local businesses. This information may change without notice. If you are coming to the Foss as part of an event, please check with the organizers to see if they’ve made parking arrangements. Those interested in contacting Republic Parking to arrange additional parking can reach them at (253) 627-4401. Google Image of the Seaport’s North lot, free and available to the public. The Seaport can be reached by bus and light rail. The number 13 bus stops on Dock Street within walking distance of the Seaport. 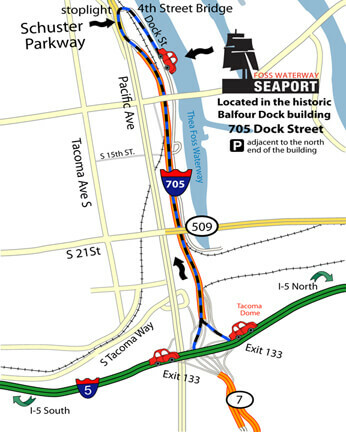 The Seaport is also within walking distance of the Link Light Rail stop at Commerce and S. 11th. The Murray Morgan Bridge located on S. 11th and A St. is accessible to Dock Street via public elevator or stairs. The Commerce St. Station is within walking distance as well and provides access to many other bus routes. For further information please visit Pierce Transit or call 253-581-8000. The Foss Waterway Seaport offers 1,200 lineal feet of affordable side-tie moorage with power and water available. Visitors may dock their boats here while visiting the museum. Moorage payment can be made using envelopes available at the top of the south gangway. Drop payment at museum or in payment box on east side of building. Up to a four hour stay is free. For moorage information, call (253) 272-2750.